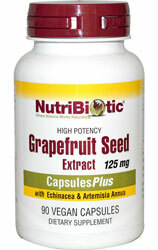 NutriBiotic® CapsulesPlus is a unique formulation that combines grapefruit seed extract, echinacea angustifolia root, and artemisia annua and is used by healthcare professionals worldwide. Suggested Use: Take one capsule one to three times daily with or without meals. Not recommended for children under 12 years of age.